Few months back we covered mobile banking applications provided by Indian banks like ICICI, HDFC and Citi. Mobile banking applications further simplify the customer needs by taking everything on their palm. They can pay bills, insurance premium, mobile bills, make transactions, get the balance info or mini statement. Private Banks are these days much faster than centralized banks in rolling out next generation banking facilities. ICICI, HDFC, Citi and few other banks introduced internet and mobile banking for the first time. The initiative form SBI to launch mobile banking application and related service would help millions of Indians, who rely on the largest Indian bank for their daily financial requirements. 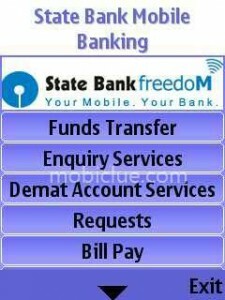 This mobile banking facility from SBI is known as SBI freedom. The basic requirement to download the application is a Java enabled handset and GPRS connection. So far, the list of supported devices includes Palm, Sony Ericsson, Nokia, Windows mobile, Samsung, LG and others. You can download the generic mobile application if your handset is not in the list. Mobile fund transfer using NEFT. Mobile bill and insurance premium payment. Get statement and balance in SBI account. Request cheque book and other services. Central Government has implemented certain rules regarding mobile banking services. These rules are also applicable for SBI freedom mobile banking service. That is you can make only 5000/10000 max for bill/merchant payments respectively. SBI mobile banking application and the activation of services are free. But there is a charge associated with SMS and GPRS usage. Contact your customer care for GPRS plans. SBI Freedom mobile banking registration is a two-step process. First the customer needs to send an SMS in specific format to 567676 and then reach ATM or SBI branch for one time verification. Change mobile phone brand and model as per requirements. Customer will then receive a message with download link to SBI mobile application, user name and MPIN that is needed to sign into the application. They can also Download SBI mobile application to PC from this link. Use PC suite or compatible application to transfer the application to mobile device and install. After installation sign into SBI mobile banking service with the default MPIN received. It should be changed to new 6 digits MPIN using the settings or using the prompt when the application is launched for the first time. Those who don’t have Java supported mobile device can also use SBI freedom mobile service. For this they need visit SBI mobile WAP site and sign in using MPIN. Step2: Reach SBI bank branch to ATM center for mobile number verification. Reach SBI bank branch and sign up the appropriate form. Or reach the nearest SBI ATM and enter debit card. Go to services mobile banking > register and then enter the mobile number to complete verification process. Thanks buddy. I am looking for the same kinda source from many hours. i am bvery thankful to you provide some valuable information as well as shared a link with us.thanks you. I received a useful information. Maybe it’s a good n very useful service.. But sad to say that i can’t download the app. with my Nokia 7610s, nor able to recieve any positive support from the Team! Was it a real Mobile Banking or service? ? ? ? i am not able to use sbi mobile banking application. its stopped at register your gpers. iit is possible that other application (file type) able to use for sbi mobile banking application. I am having sbi account and I am interested in using mobile banking service and internet banking service. i am using sony ericsson w395 handset.it is not showing my mobile model no. what should i do.how can i download that software to my mobile. I WANT MY MOBILE BANKING NO IS 9010110128, PLEASE ACTIVATE. anyone aware of iphone app for SBI mobile banking, I don’t see one in the website. I WANT MY MOBILE BANKING NO IS31464991059, PLEASE ACTIVATE. since one month i m trying 2 get my mobile banking activatwd sadly it turned out 2 be failure. i m disappointed. How to activate SBI Mobile Banking. Please kindly issue the mobile banking software. I,want sbi mobil banking app.for download to Nokia 3110c device,my No.is 9451549949 plz. reply soon. i failed to find sbi mobile banking software for nokia 5233..please help me friends. my mobile banking activeted on my sbi a/c but i want sbi mobile banking app.for samsung galaxy 3 i5801 ,my No.is 9503445533 plz. reply soon. plz i want mobile banking and i belev u send softwere and good intrection.